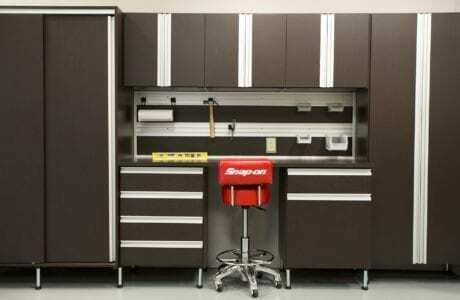 Is your garage so cluttered you can barely fit your car in? Or is it such a mess you don't want to spend any time in it? Here at California Closets of Southwest Florida, we believe the garage is a valuable extension of your home, and can be used as practical working and storage space. Storage cabinets. Create a functional area with custom-designed cabinetry including specialty rack, shelves, and drawers to make organization and storage efficient and easy. Sort tools, sports equipment, keepsakes, and holiday decorations with ease. Durable drawers. Ideal for smaller items, while baskets provide easy access to sporting equipment and gardening supplies. Use a slat wall system to hold all the rest. Workbenches. 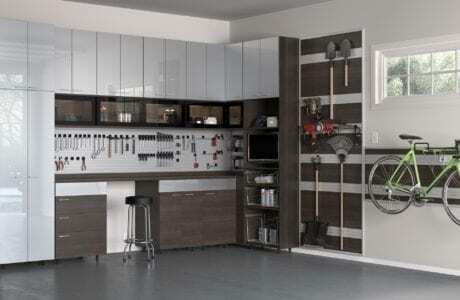 Another versatile storage solution is a workbench system, complete with slat walls and cabinets that provide access to and organization of frequently used equipment and tools. Schedule your complimentary in-home design consultation to get started today.